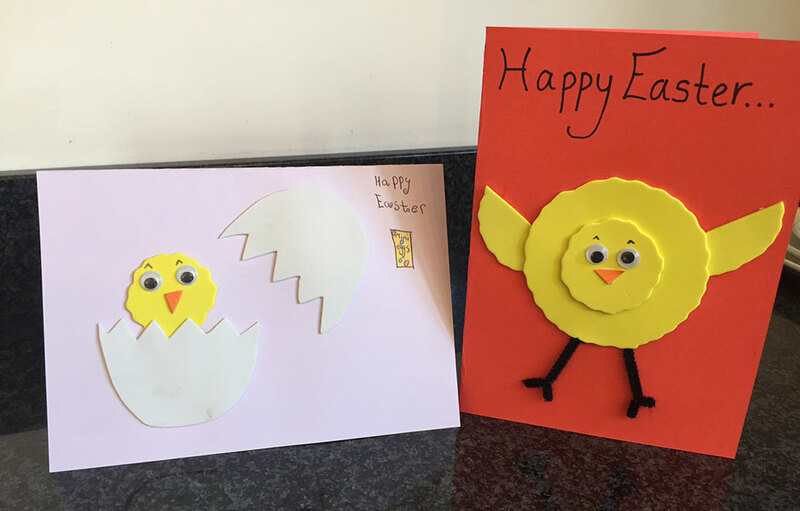 All you need for these cute cards is; A4 card, foam sheets, googly eyes, PVA glue and a black marker or black pipe cleaner. For the cracked egg card, make a chick shape from yellow foam and stick this first onto the card. Then cut out an egg shape from a foam sheet and zig zag cut across it to create your two halves of egg. Stick these on and decorate the chick with googly eyes and a small triangle of orange foam for his beak. For the chick card, using a circular template (we used a small mug), cut out a yellow circle from foam to make the body. You’ll then need a smaller template to create the face of the chick. The wings are just two semi circles. To create the ‘feathered’ look, use small scissors to make the edges less straight. Stick the large circle on first, then add the wings, pushing them just under the large circle. Next stick on the smaller circle for the face and add googly eyes and a small orange, foam triangle for the beak. We made the legs from two small pieces of black pipe cleaner but a black marker would work just as well. 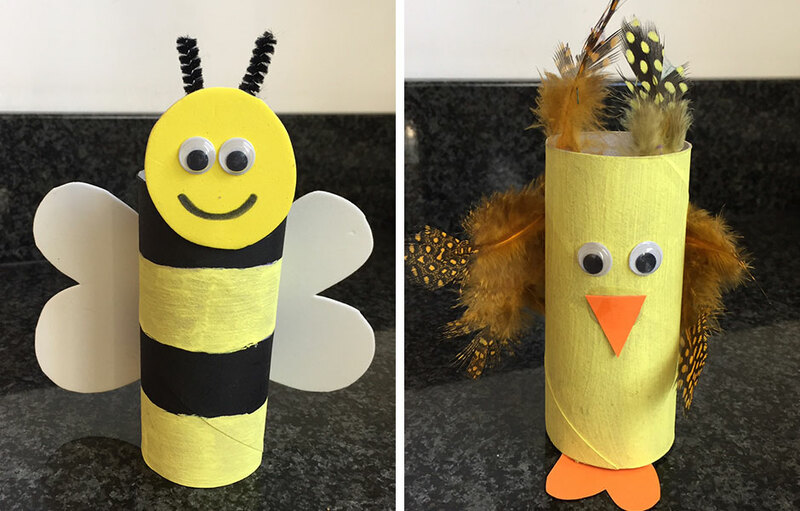 To make the Bee and Chick, you’ll need; paint, toilet rolls, PVA glue, A4 foam sheets, feathers and googly eyes. Firstly, paint the toilet roll in the colour you’d like, we chose yellow with black stripes. To create the bee, cut out the wings from a sheet of foam. It’s easier to use a pencil to create the perfect shape before cutting out. You’ll also need to cut out a small circle for the face. Stick the wings onto the back of the toilet roll. Then stick googly eyes onto the face, a black marker is great for adding a smile, eyebrows etc. Two small pieces of black pipe cleaner are fantastic for antennae. Finally, stick the face into position. To create the chick, cut out the feet using orange foam and stick to the bottom of your painted toilet roll. Then add googly eyes and a small orange, foam triangle for the beak. Lastly, choose some feathers and stick them onto the sides and top of the roll to create wings and a cute feathery look. 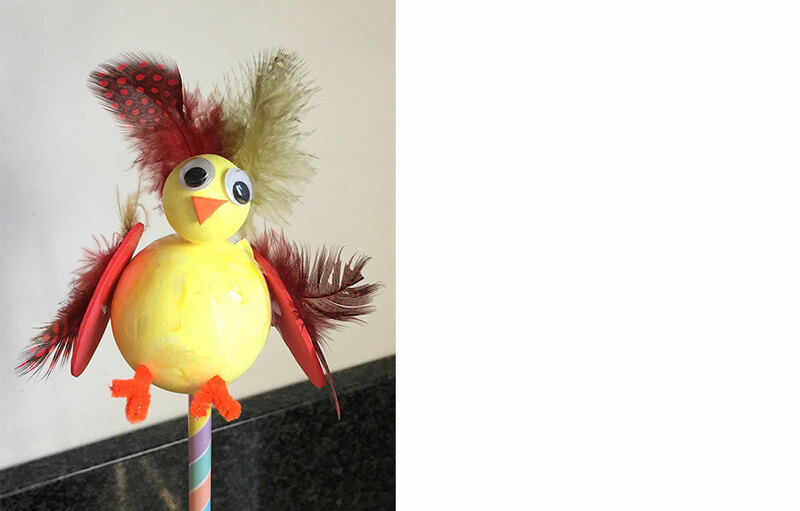 Our final Easter creation is the lovely pencil topper. To make this you’ll need; paint, polystyrene balls (two sizes), foam shapes or sheets, googly eyes, feathers and an orange pipe cleaner. Firstly, paint the two polystyrene balls. To make this easier, you can stick a pipe cleaner into each ball to give you something to hold whilst painting. Once dry, stick the two balls together and leave them to dry. Next, stick on two googly eyes and an orange, foam triangle for the beak. You can use foam shapes for the wings or cut out your own from a foam sheet. Stick these onto the body with PVA glue. Use feathers to accentuate the wings by sticking them on top of the foam wings. You can also add feathers to the head too by just pushing them into the polystyrene or gluing in place. Lastly, cut two small pieces of orange pipe cleaner and stick these into the bottom of the body to create the little legs. Now you can insert the pencil into the bottom – it is easier if you use a pipe cleaner to create a small hole first. So simple to make and yet so effective. 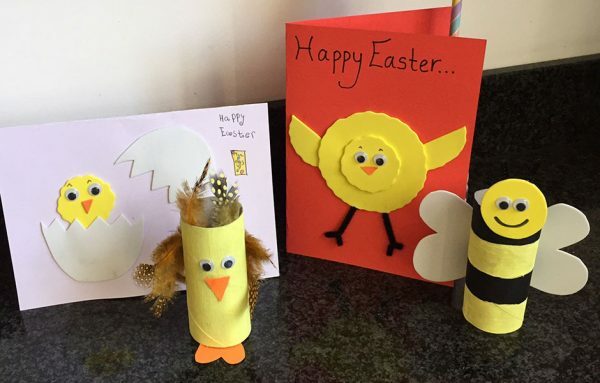 Please do send us your Easter creations, we’d love to see them!